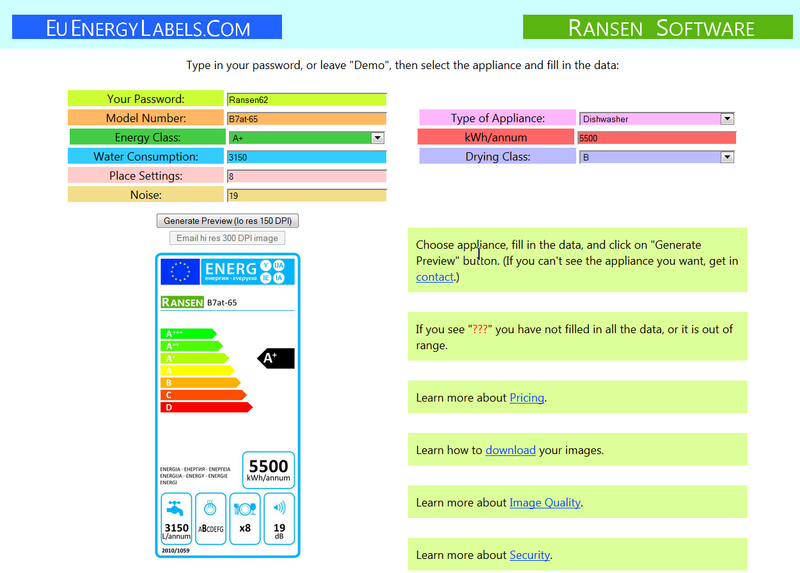 Ransen Software Announces EU Energy Labels online app. Manufacturers to increase the efficiency of their products. These labels are not optional, they are legally required, and the format (colours, size, wording) for each type of product is precisely defined. This is so that consumers can swiftly compare two product's energy consumption at a glance. There is no more need to leaf through complex and/or confusing user manuals or compare manufacturer's labels, which have different information presentation styles. Ransen Software's EU Energy Labels site has an online app (click here for screenshots) where you only need to fill in the text and numeric data, click on the Create Label button and the image file will be available to you within seconds. There's no need to phone the graphics design department or get an external graphics consultant to make a new label or modify an old one. All the images in the full version are created at the industry standard 300 DPI, though higher DPI images can be handled by special request. Other labels are in development. A one month subscription costs €50 Euros, and a year's subscription costs €300 Euros. You can try the free demo on your device of choice just by going to http://www.EuEnergyLabels.com. All these screenshots can be used to accompany the press release. Click on each thumbnail to see the full sized image.